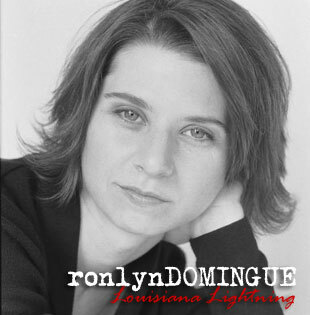 RONLYN DOMINGUE is the author of the acclaimed novel The Mercy of Thin Air and the owner of one of the most mispronounced surnames in TNB Nation (we’re pretty sure it sounds like meringue). Said novel, a Borders Original Voices Award Finalist that was acquired by eleven — count ’em, eleven — countries, is held in high esteem by pretty much everyone…except the geniuses at the New York Times. Her writing has appeared in New England Review, Clackamas Literary Review, New Delta Review, The Independent (UK), and, most recently, Shambhala Sun. This last publication seems an ideal fit for her, given her love of the beauty of nature and her hatred of war. She loves insects and leaves…and also football and Rush (we imagine “The Trees” must be a favorite of their songs). She learned a lot from being a writing coach to a man on death row…so much that she wrote a four-part series on the exchange. Her artistic skill goes beyond pen and paper…check out her blue doll, What Promise Was Broken. She was also a reluctant beauty pageant contestant. And did we mention Rush? Ronlyn’s 4 part story of her coaching of a man on death row is astounding. It should not be missed. It’s doesn’t necessarily go where you think it is going. If she ever isn’t writing something else for a minute, she really needs to turn it into a non- fiction novel. Read it yourself & see if you don’t agree. On top of being a really, really good writer, she is one of the kindest, mist generous people you’ll ever encounter. Hooray for Ronlyn with the unpronounceable last name! Once Novel #2 is done, I can think about what to do next with Feltus’ story. Quick….if I tested you, could you say DOMINGUE correctly? I can see that I have to prove myself. Alas, it’s DOH-MANG. Equal emphasis on the syllables. Really, my ancestors should have kept it as it was–Spanish with the Z at the end! We should form a girls who like Rush club! Rush fan since 1986! I still wear my Power Windows t-shirt. Did you see that documentary about them that came out like a year ago? Hey, I would join a “girls who like Rush” club. Hooray Ronlyn! Looking forward to going back through a couple of these older ones I’ve missed. Another Rush fan?! At some future TNB reunion, you, Stephanie, and I must convene. Ronlyn! Champion of so many writers here at TNB… she is most deserving of her “honor”… her pieces are heartbreaking vignettes, songs you wished you’d written, prose poems with words so tender they make you ache. Thanks, Robin! We have quite a talented family here. Congrats, Ronlyn! A perfect vehicle for catching up on your back catalog. I look forward to it.